This carpet was cleaned by Chem-Dry of Tampa FL. The visible spots are from a 10 yr old poodle that had stones in it's bladder that created a urinary problem for the dog. Fortunately, Chem-Dry of Tampa FL specializes in pet urine odor removal in carpet and upholstery. Our two phase cleaning system treats the visible urine spots and the underlying issues of urine odor in the carpet pad. Cleaning the pet urine out of the carpet does not remove the pet urine odor from the home. The only way to remove pet urine odor is to treat the carpet and the pad together. Pet urine soaks through the carpet and into the pad underneath. A regular carpet cleaning will pull some of the urine out of the carpet but it cannot remove it from the carpet pad. 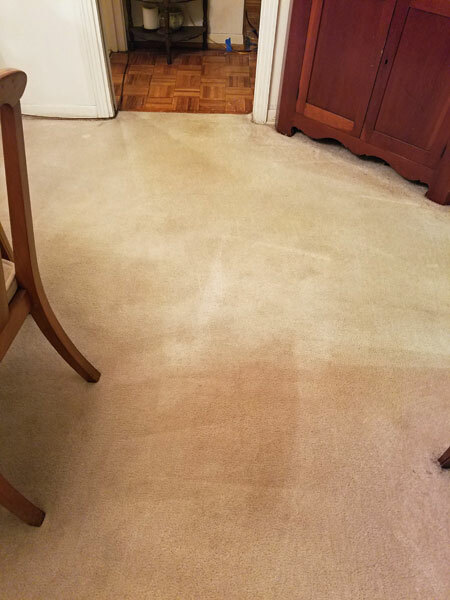 At Chem-Dry of Tampa FL we clean the carpet and then treat both the carpet and the carpet pad underneath with our patented Pet Urine Removal Treatment (P.U.R.T). This treatment eliminates the pet urine odor and the yellowing stains that go along with it. This product is designed to remove even the toughest urine stains and the most obnoxious urine odors in your home. 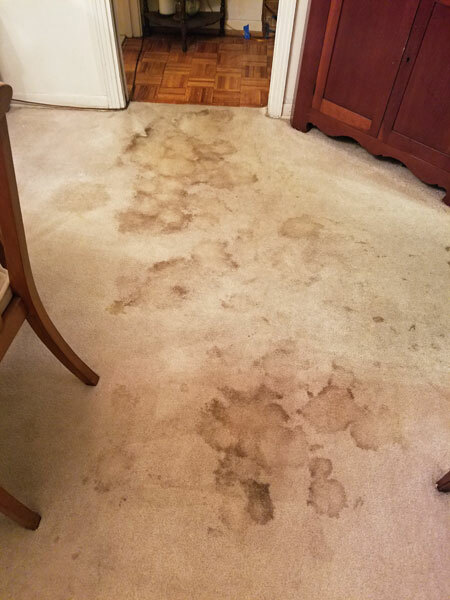 As you can see from these images urine damage in carpet can be severe and much more than an eye sore. The ammonia off gassed by urine crystals can be a respiratory irritant. Our pet urine odor removal system removes 99.9% of the urine in your carpet and pad. Allowing you to breathe easier knowing your house is drier, cleaner, healthier.